Troy is an epic movie with many battle scenes depicting valour and skill. It's one of my most favourite movies. Now I shall talk about the battles shown in the movie. What happened: Achilles and his men formed a shield wall (primitive form of turtle formation?) to close on the superior Trojan archers and then broke off to engage the defenders in a melee combat where they excel. 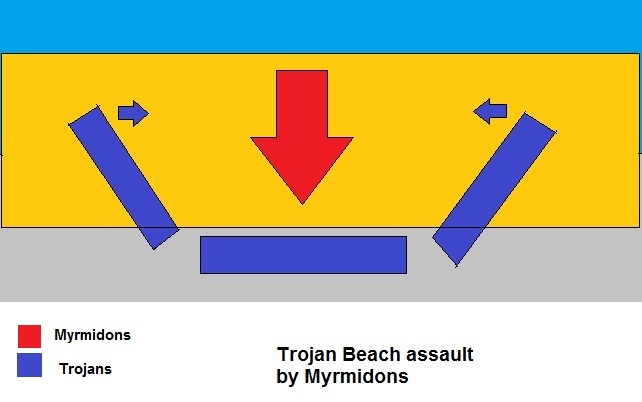 What could happen: Since Trojan beach defenders were numerically superior a simple double pincer movement could have done the trick. The Trojans shoot at the myrmidons as they disembark from their galleys and as soon as the shield wall is formed they take the advantage of the slow moving formation of the enemy by moving their both wings forward while their center holds the ground. This should envelop the enemy. If the enemy attacks one wing the opposite wing can give fire support. If they attack the center they will be completely encircled and that could nullify their excellent melee skill. Achilles eager to capture the beach before Greek forces arrival would certainly make haste to break the shield wall and hence make themselves vulnerable to arrows. If he chooses force concentration the archers will take care of his troops and if he chooses to disperse them their effectiveness in melee combat will reduce effectively. Trojans will have casualties if myrmidons are far more skilled in melee combat than them but they will be able to hold off them until reinforcements arrive from the city. Problems with such approach: The Trojans, being on the high ground, would be reluctant to leave their advantage of terrain and move their wings into the beach. Their center could withdraw to higher ground but that would require time. Moreover their army would not possibly be routed even after heavy damage because of their supreme morale due to presence of Achilles. What happened: Greek phalanx charged into Trojan ranks in a head on assault and got repelled. They could not break cohesion of Trojan ranks and their own rear ranks were extremely vulnerable to Trojan archers shooting from top of the wall. They broke into a rout and suffered heavy casualties. What could happen: In order to succeed Greeks had to reduce the effectiveness of Trojan archers. If they formed turtle formations their mobility would be nullified and they would fail to charge the ranks of Trojan soldiers. The only way to preserve mobility and advance in front of such heavy fire power is to charge the corners of enemy formations. That would give the Greeks triple incentives. First, the Trojans would not be able to bring their superior firepower along the length of the wall to bear effectively upon the charging Greeks. Second, Greeks would have been able to concentrate their force on a smaller front of engagement. Third, the heavily defensive Trojan line would be weaker at corners. If the Greeks are able to achieve a breakthrough they would be very close to the walls effectively protected against the archers on top as the rear ranks of archers would not be able to fire below. Now they can approach the gate and try to ram it down. Even if this approach does not gain the much desired breakthrough this would compel the Trojans to reorganize their troops making some part of their line weaker in order to commit more troops to hold off the charging Greeks. 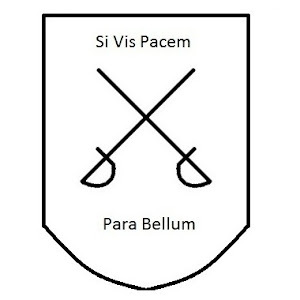 These weaker points could be manipulated to achieve a decisive breakthrough by a reserve force provided the Greeks have numerical superiority over their opponent. 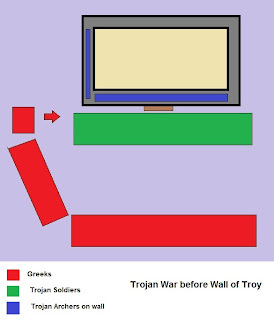 Problems with such approach: The Greeks would probably not be able to breach the walls even if they achieve the breakthrough. Without any sort of siege engine the walls of Troy could not be hoped to be breached. They could not besiege Troy either to starve the Trojans out because Troy had ample supply of food while Greeks being far from their homeland could not afford an effective line of supply across the Aegean Sea. Foraging would not help them either because their superior number meant they were in need of more food than that could be foraged (of course not if the Trojan villagers left ample food stuffs behind before running into the safety of the city). Whatever they did they would suffer massive casualties while their opponent would suffer minimal. This fact might also reduce the morale of their troops had Odysseus not came up with the idea of ‘Trojan horse’.